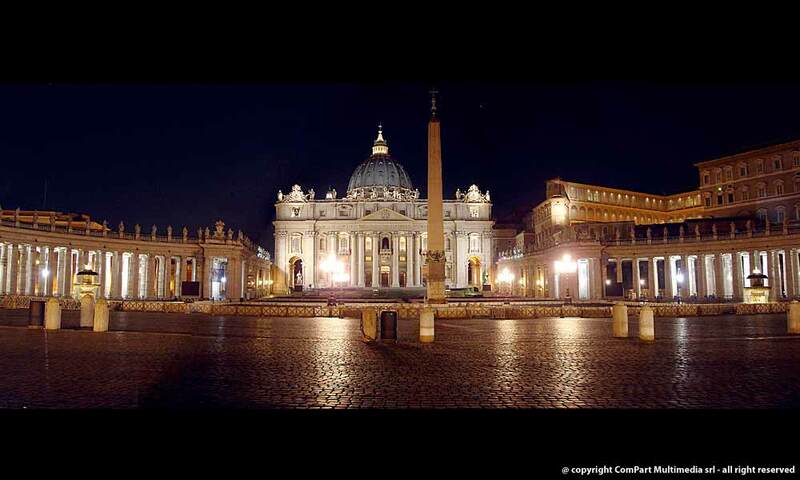 St. Peter's Square, or St. Peter's Piazza (Piazza San Pietro), is located directly in front of the St. Peter's Basilica, in Vatican City, an enclave of Rome. Designed by Gian Lorenzo Bernini using classical style as a platform, mixing Baroque style to give more emotion, and is topped off using an Egyptian artifact as its center. The classical style of the piazza is seen in the Doric colonnades, which frames the trapezoidal entrance to the basilica and the massive oval area which precedes it. The colonnades define the piazza; to date, no better example of colonnades exist. The oval portion of the piazza, which contrasts with the trapezoidal entrance, creates a Baroque feel. In the Baroque era, the oval replaced the circle, and centralization replaced balance, reflective of the Counter-Reformation occurring in the Catholic Church. At the center of the oval rests an Egyptian obelisk, which, including its base and the cross on top, stands forty meters tall. The obelisk, which dates back to 13th century B.C., was moved to Rome in the 1st century to stand in the Circus of Nero, and then moved to its current resting place in 1585 by Pope Sixtus V. Although Bernini had no influence in the construction of the obelisk, he did use it as the centerpiece of his magnificent piazza. Bernini did, however, design the second and final fountain that flanks the obelisk in 1675, just five years before his death. The square was designed by Bernini to take the same dimensions as the Colosseum.